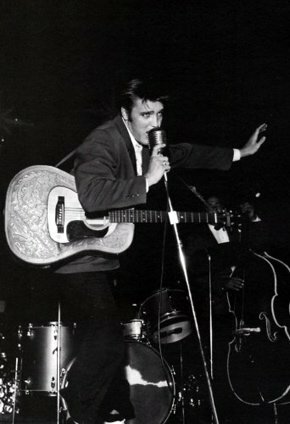 Among all his nicknames, though, the two that have remained permanently embedded in the pop culture lexicon are “Elvis the Pelvis” and “The King of Rock ’n’ Roll.” The former arose from his detractors’ need to belittle Presley and the latter from his supporters’ desire to exalt him. Putting aside the title, “The King of Rock ’n’ Roll,” for now, let’s take a closer look at the phrase, “Elvis the Pelvis”—its origin, its inferences, and its applications to Elvis. It’s obvious, then, that from the beginning, despite his later claims that his shaking on stage was an unconscious response to rock ’n’ roll music, Elvis purposely used sensual movement on stage to entice an emotional response from his audience. Over the next couple of years, he expanded his repertoire and the intensity of his physical outbursts to maximize the ebb and flow of the crowds’ fervor. However, considered just another hillbilly singer on a fledgling Memphis r&b label in 1954, Elvis remained under the radar of the press in the communities he played as an under-attraction in traveling country and western shows. 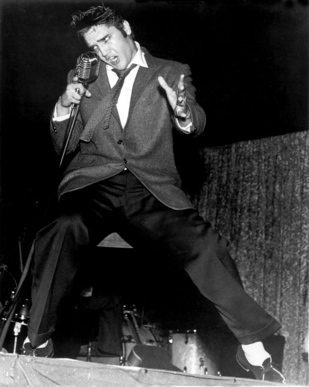 It wasn’t until early in 1956 that his signing with RCA, his network TV appearances, and his first #1 record on Billboard’s pop charts forced the media to pay attention to Presley. Local newspaper writers struggled to describe his stage act. Reviewers started using words like “jerking,” “squirms,” and “gyrations.” When an Associated Press article described him as “Johnny Ray with the St. Vitus dance,” the image stuck briefly. Frances Melrose repeated the image in her article about Presley’s April 8, 1956, show in Denver, as did Ken Kennamer in his review of Elvis’s appearance in Lubbock, Texas, two days later. Unfortunately, Keel's claim that he was the first to coin the famous nickname doesn't add up. He did indeed interview Elvis in Jackson and write an article about it. That article appeared in the Clarion-Ledger the morning of July 10, 1956. 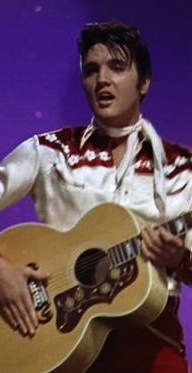 In it Keel explained that Presley, en route to Florida, stopped his ’56 Cadillac El Dorado at a Jackson filing station on the evening of July 9, 1956. When Elvis made the mistake of getting out of his car, teenagers immediately flooded the station seeking autographs. That forced Elvis to stay in Jackson much longer than he planned, and allowed the Clarion-Ledger time to send Keel down to the station to get a story. Keel’s interesting account in the Clarion-Ledgerof his meeting with Elvis was certainly entertaining. The basic question, though, remained. “Did he use the expression ‘Elvis the Pelvis’ in the article?” If, as he claimed, the expression suddenly came to him while he was walking back to the office, he certainly would have used it in the article he wrote for the following day’s paper. Of course, in the definitive history of Elvis, it wouldn’t have mattered if Keel had used “Elvis the Pelvis” in his article, since the nickname had already been widely in use for at least three months. So, the credit for originating that iconic Presley nickname remains unclaimed for now. "You know Elvis, don't you? He's a geetar with six broken strings and a loose pelvis. Elvis the Pelvis, they're calling him." Notice Williams does not claim to have originated the term. Rather, he is repeating as expression already in use in the media earlier by the spring of 1956. 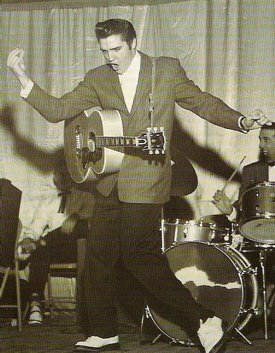 Regardless of exactly when “Elvis the Pelvis” was first coined, the nickname got big time traction in the country’s print media following that second appearance on the Berle show, and it continued through the end of 1957, when Elvis stopped doing live shows. “Elvis (The Pelvis) Presley came to town yesterday, and last night 9,000 rock’n’rollers ‘flipped’ … But at least his lips were moving, and his pelvis certainly was. He wasn’t halfway through ‘Heartbreak Hotel’ before it became apparent nobody ever had a more appropriate nickname. … A brief talk with the Pelvis disclosed that he was glad to be back in Shreveport … With teen-agers giving every indication of tearing the Pelvis limb from limb out of sheer admiration and animal spirits, the police threw up more or less effective barricades." Despite the “pelvis” overload in his article, Masters had no apparent beef with Presley. Like many writers then, Masters seemed to be motivated solely by the term’s comical aspect while discussing Presley. Usually the context in which reporters used the various “pelvis” terms revealed their underlying opinion of him. 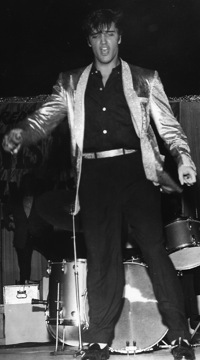 Still, Elvis made it clear he didn’t care for the nickname, “Elvis the Pelvis,” in any context. Surprisingly, a few journalists seem to think that Elvis’s fans embraced it as a term of endearment toward their idol. 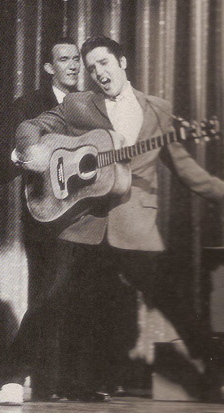 In an August 1956 Miami Daily News article, a reporter claimed that Presley was “known by both his admirers and detractors as ‘Elvis the Pelvis.’” And during that same Florida tour, Bella Kelly in the Daily Newsreferred to, “the ‘Pelvis,’ as he is affectionately called by his teenage fans.” Neither writer provided any proof or even one example to support their nonsensical statements.